Busy, busy, busy, yes we are! We’ve got a quick shoot in the Mile High City this week and then back home to Peoria and that sure will be nice! As some of my road warrior friends know, being on the road for a bunch of time can really start to get to you. Don’t get me wrong, we do love road trips and being on the road for shoots and also vacation, but when you’ve been out there as much as we have been this year, it’s sure nice to get back home! There’s something very special about eating your own food and sleeping in your own bed and that’s pretty darn nice!! 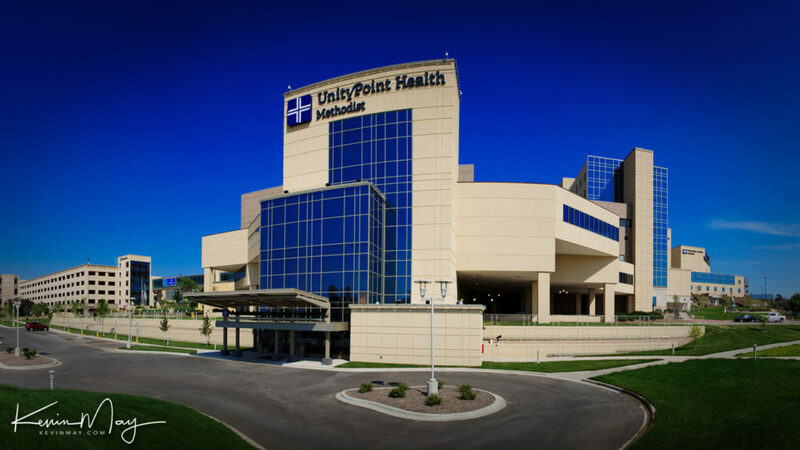 Over the last year or so, our friends at UnityPoint Methodist Hospital in Peoria have been giving a much needed freshening up to the exterior of the hospital. I couldn’t even begin to tell you how old the original brick was that they had at the hospital, but it was time for a face lift! To see what they’ve done to the hospital is amazing and what a difference it’s made in the look and feel of the place! They wanted some new photos of the exterior of the hospital and we were able to get out and grab a few snaps of the new and improved UnityPoint Methodist Hospital and I have to say that it’s looking pretty darn good! Here’s one of our shots and what a difference a day makes!